Woodbury Police Join In On More Cops. More Stops. WOODBURY – Woodbury drivers beware. The Woodbury Police Department is teaming with law enforcement agencies all across the state to crack down on traffic safety violations. State and local law enforcement will be out in force April 12-22, 2012, to remind all drivers and passengers to never drink and drive, always buckle up, obey the speed limit, and eliminate all distractions in the vehicle while driving. This special law enforcement crackdown is part of the state’s More Cops. More Stops. campaign to help save lives on Tennessee’s roadway. “We want everyone to be safe while traveling on the roads of Woodbury and Cannon County,” WPD Chief Kevin Mooneyham said. 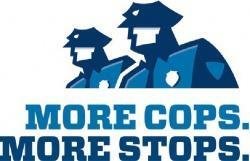 “So we are teaming with other state and local law enforcement officials on this special ‘More Cops. More Stops.’ campaign to crack down and strongly enforce our most basic and important highway safety laws. Sixty-nine percent of 18 to 34-year old passenger vehicles occupants killed in Tennessee crashes during 2009 were not wearing seat belts at the time of the crash. “Not wearing your seat belt will get you a ticket, but we will also be cracking down on speeding and distracted driving, and especially on anyone drinking and driving,” Chief Mooneyham said. Chief Mooneyham said nearly one-third of those killed on Tennessee’s highways during 2009 involved drivers or motorcycle operators with a blood alcohol concentration (BAC) of .08 or above at the time of the deadly crash. Research and fatal crash statistics show that young adult males are most likely to practice high-risk behaviors while driving, such as not wearing seat belts and/or drinking and driving. More than 1,000 passenger vehicle occupants were killed in Tennessee motor vehicle traffic crashes in 2010. Fifty eight percent of them were not wearing their seat belts at the time of the crash. Because nighttime passenger vehicle occupants are among those least likely to buckle up, and most likely to die in crashes when unrestrained, nighttime enforcement has become a growing priority.